Through the power of social media, I was able to quickly determine that this is an old link to a project done in by Gene Weingarten of the Washington Post. Justin and I have a long tradition of reading the Sunday paper together, dialoging about stories, laughing at the comics side by side, suffering through the crossword puzzle (in actuality, he does the puzzle…I look up obscure things on the internet when he is stumped.) Mr. Weingarten’s weekly pieces, Below the Beltway, often cap off the day. Long known to me as a humorist, I found myself completely obsessed with these short, little autobiographies that he had edited as a part of a “Time Capsule” issue done back in 2000. He since let me know that the Post was so engaged with the project that they continued it as “Life as Haiku”. My name is Jean Barrett of Vienna. I am picking acorns out of the pachysandra and reflecting on my life. The baby has her first bad cold. Our 3-year-old son alternates between being contradictory and affectionate. My husband and I are getting over an argument. As I hear more acorns hitting the roof of the car, I realize that I am happier than I have ever been. Because we have these demanding children. Because we must struggle with an imperfect marriage. And because it is one of those warm, bright Sundays in autumn that I wish would never end. I am Dorit Jaeger. I am from Saxony, in Germany, but I live in Vienna, Va. Am I an adult after 18 years of growing up? Am I an educated person after 12 years of school? Am I a woman after seven years of menstruation? Am I a vegetarian after 5 years of eating no meat? Am I a heterosexual after some boyfriends? Am I a good au pair after six weeks of caring for children? At what age does one know the answers to these things? Someone please tell me. I find it no surprise that I am drawn to the women, the mothers. I’ve long been fascinated by people and their stories. I’ve found, in my work, that I’m the best clinician when I am first the best listener. So many clues and insights to be had. I am also one that finds strength in finding my own story. I’m going to spend time over the next few weeks working on my own 100 words. 100 words about my journey as a breastfeeding mother. And because I believe so strongly in our collective story, I want you to join me. Don’t you find strength in the stories of others? Our culture has demanded that breastfeeding be hidden, closed behind doors and covered up but I can be instantly encouraged when I know that I don’t walk this road alone. So, will you walk with me? 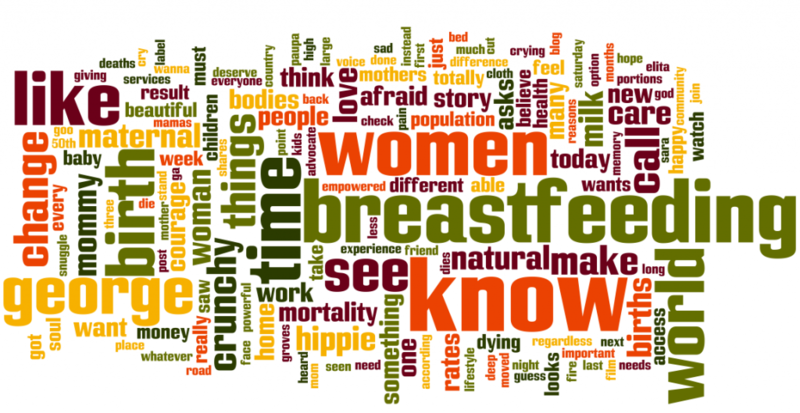 I want to hear your story, your breastfeeding story in 100 words or less. * Stories can be submitted for publication to this blog by emailing them to me at amber@ambermccann.com. Please keep them to 100 words or less. Before publication, stories will be edited only for minor spelling/grammatical errors. If the stories will be published in any other medium or venue, other than this blog, your permission will be obtained. Feel free to widely share this post and encourage others to also submit their stories. This is a great idea! Am I able to publish my bio on my own blog also? Absolutely. I can’t wait to read yours. Do we have to be done breastfeeding? I am 6.5 months in with my son. I hope to make it a year. Kari, I would love your story! This is great! I wrote a post on this today, it’s definitely not less than 100 words, sorry! Hi Amber I took up the challenge, and send through my story! Thanks for helping to empower us by compiling our stories!